Creating a creature with ONE MILLION attack and life. Yes, that is a 1,000,000/1,000,000 Apex Predator. No it isn't photoshopped, and no there were no bugs involved. Can you figure out how I did it? You play against a friend/smurf, who also plays cards to help you. There is no card restriction, however my method has no RNG. I can reproduce it every time, even in the worst-case draw order. 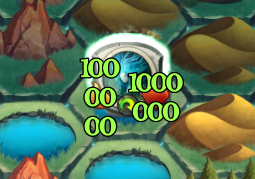 I have not tested it myself, but I have been told there is a 500 turn limit. If this is true it doesn't effect this challenge. So for example, I'm not playing Chrysalis and waiting a million turns. The creature does not need to be Apex Predator. For a harder, arithmetical challenge, try getting 1,000,000/1,000,000 exactly. Feel free to pm hunter#6123 to ask any questions or give your solution (screenshot or written). A video solution will be posted next Faeria Friday.